Today’s post won’t be about Mississauga, but instead about a day trip we took from there. Today was a glorious, warm, and sunny fall day, and it was also a holiday, being Canadian Thanksgiving. We had already finished with the big dinner earlier on Saturday, and so we decided to go on a “fall foliage tour” to a couple of our favourite southern Ontario places. After spending time taking in the sights of Belfountain & Erin, Ontario, we then headed west to the lovely town of Elora. The weather was great, and although it’s been a couple of years since our last visit, it is gratifying that not too much has changed in this quaint village. Elora is located about 100km northwest of Mississauga, in a scenic area near the Grand River, and near a very deep gorge known as the Elora Gorge. There are a lot of artists who live here, and the town is indeed known as an artists colony. 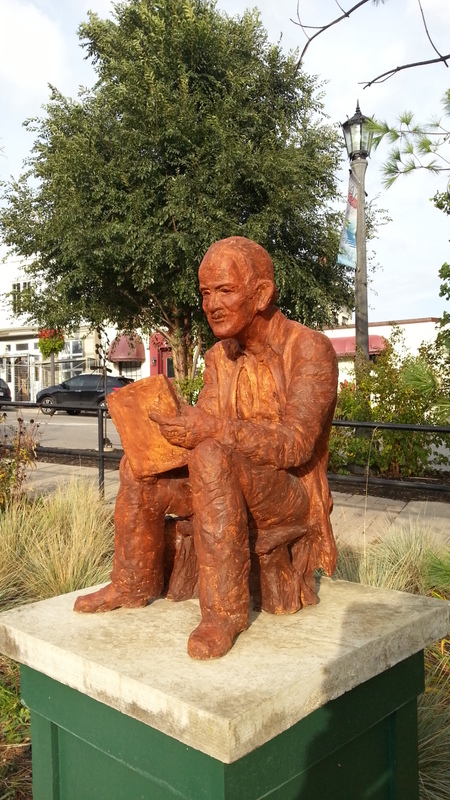 While wandering the quaint boutiques in the downtown area, we found a lot of public art on display – there were quite a few to be found in various locations with a Halloween theme, but also this guy – an interesting statue of A.J. 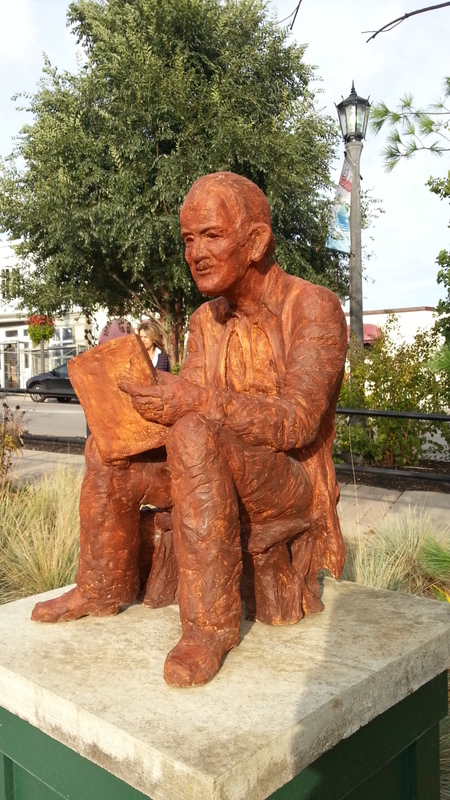 Casson, by local artist Beverley Cairns. This is in a park near the centre of town. The material appeared to be some sort of clay or ceramics…. A.J. Casson was a renowned Canadian painter, and a member of the ‘Group of Seven’. There were other works of art in the park, but this particular sculpture had a definite presence – you could really ‘feel’ it, standing nearby, kind of quirky, in a very attractive way. The good citizens of Elora are a lucky bunch. 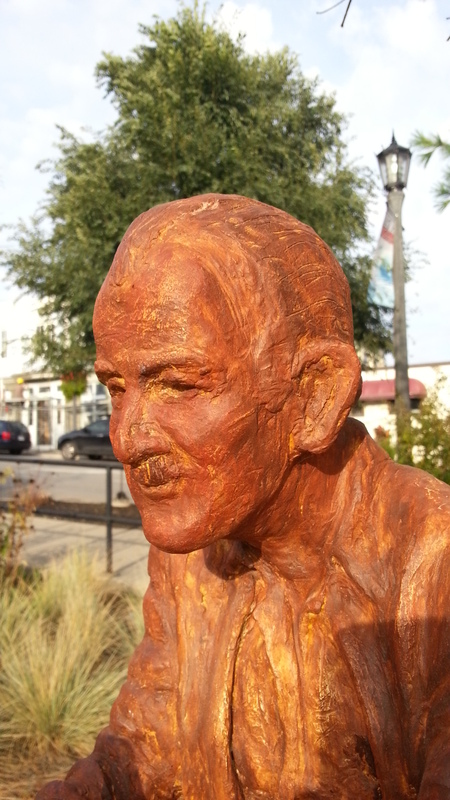 If you haven’t been to Elora yet, or if it’s been a while since you’ve been there, it’s definitely worth the short drive, and the public art is a bonus. 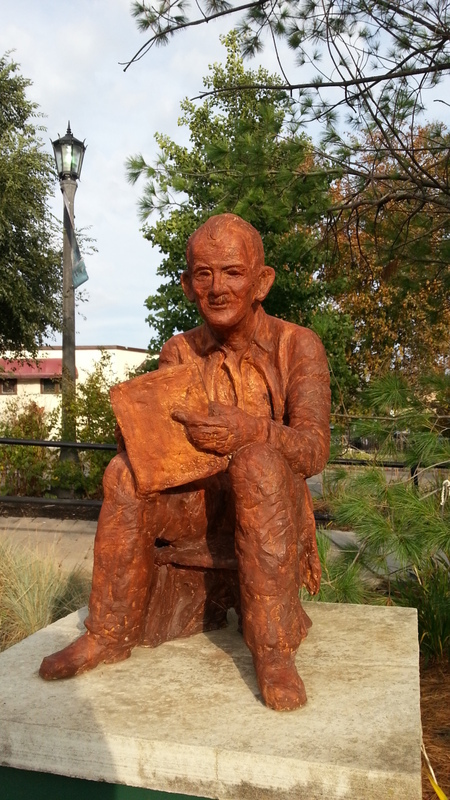 Enjoy public art? Does it have a place in our cities and towns? Do you like this sculpture? Share your thoughts in comments below, we’d love to hear from you! 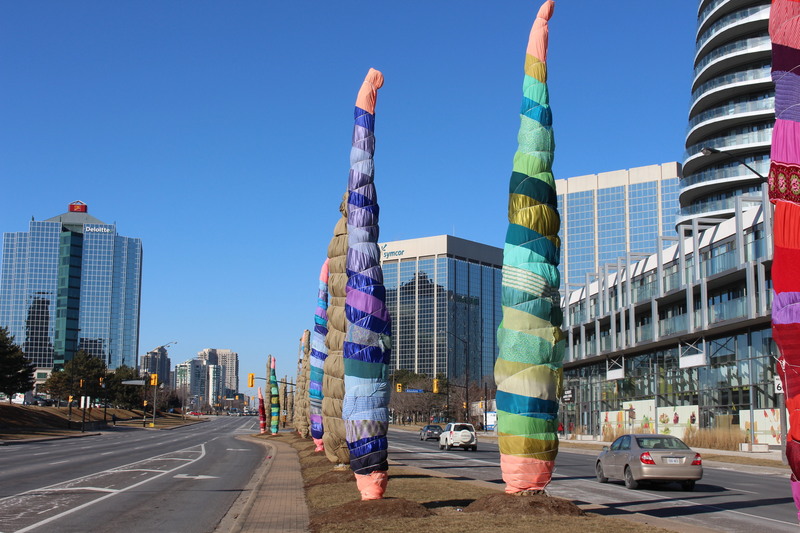 The City of Mississauga continues to make interesting additions to its public art program, with another new and colourful project coming on stream last month. 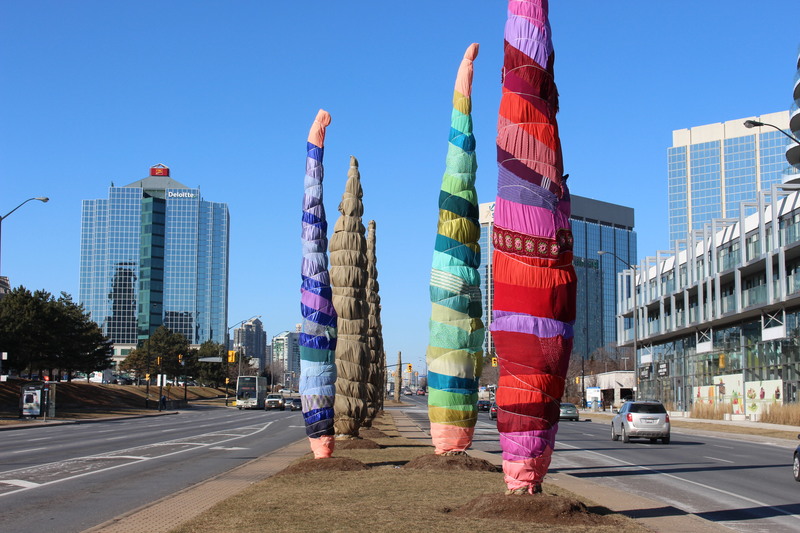 This one is titled “Tree Quilts”, and it is bringing a splash of colour and whimsy to the intersection of Hurontario St. and Burnhamthorpe Rd. 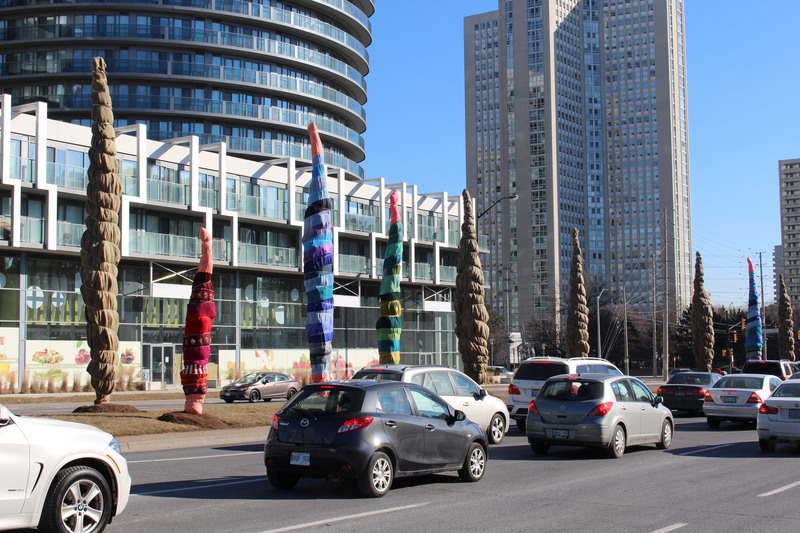 W.
Tree Quilts consists of decorative wrapping of 11 trees located in the median of Hurontario St., which are part of a larger group of trees which are normally wrapped in regular brown burlap to protect them against the elements each winter. These 11 trees have been wrapped in colourful fabrics and quilts, which were custom made by the artist. Created by Toronto based design studio Fugitive Glue, these bright and colourful quilts have brightened up the intersection, and have been bringing smiles to Mississauga residents since their unveiling. People that I’ve talked to seem to like the splash of colour that the quilted wraps bring to this busy part of Mississauga, in the heart of the city, and directly across from Square One shopping mall. They certainly do make an impact when you first see them. This public art display will disappear when the trees are unwrapped in the spring; hopefully they will return next year. Fugitive Glue is a collective of artists and designers, under the direction of founder Jano Badovinac. They have a website here. My only complaint? I wish that all the trees had been wrapped this way! It’s been 5 months since the “Contemplating Child” sculpture was installed at Mississauga Community Common Park, located in the heart of the city centre. 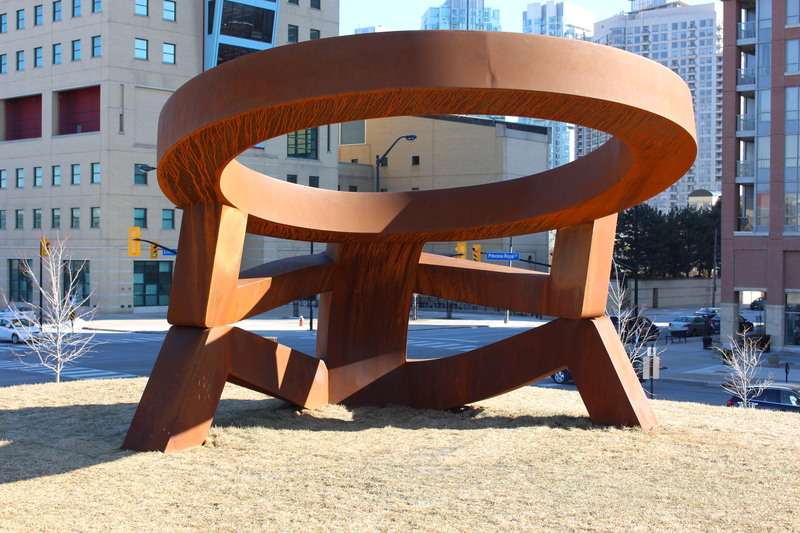 Situated on a hilltop at the eastern end of the park, and created by Toronto artist Ferruccio Sardella, this has quickly become a popular landmark and meeting place in the Square One area. 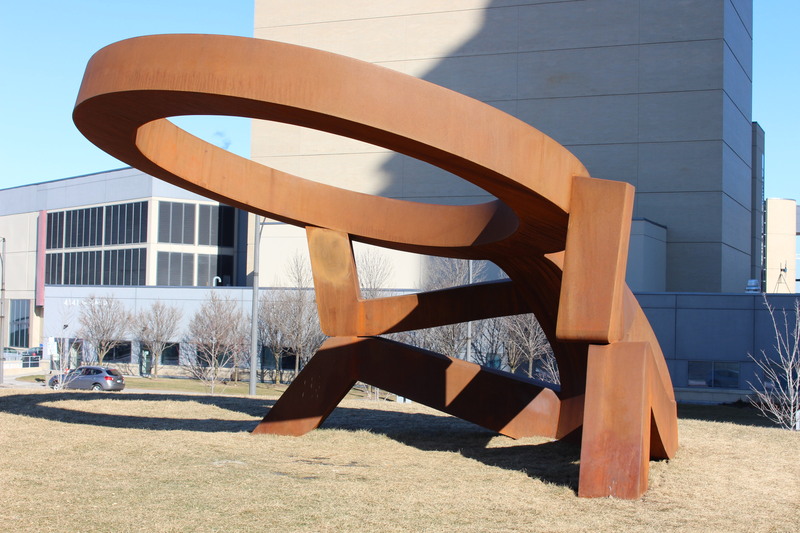 Created out of Cor-Ten steel, and weighing 3,500 pounds, we often see people taking photos here, and children hanging out and climbing on the structure. Contemplating child is one of a series of recent public art additions in the City of Mississauga. Ferruccio Sardella is an artist based in Toronto, and he has a website here. When I first saw this in August, 2014, I thought it more resembled “sad and lonely” child, or maybe “hungover adult”, but it has grown on me, there is certainly an interesting quality about the piece. 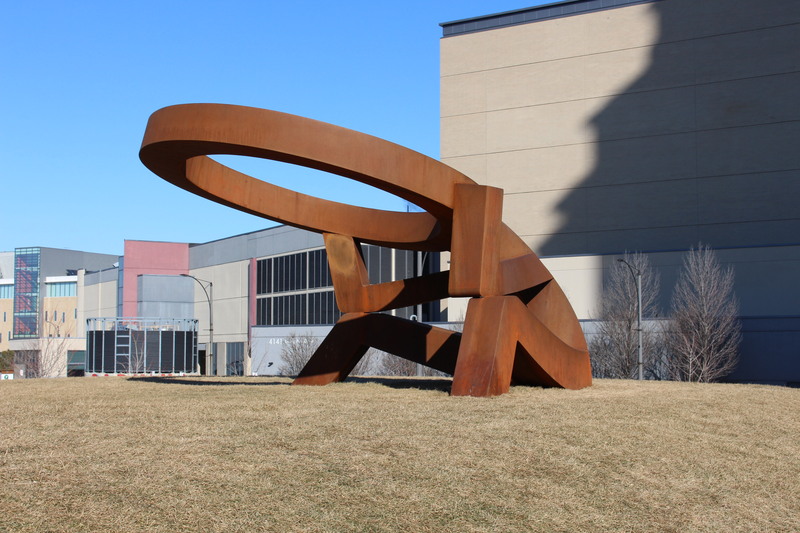 Feel free to comment and tell us what you think about this sculpture, and all the other recent public art installations in #Mississauga. Personally, I think they are all great, each one is completely different from the others, each has a specific message to relay, and each of them humanizes and adds a certain amount of charm to the city centre.